*Enjoy superior sound quality, simplified installation and maximum durability with the new KICKER/SSV Works Audio Package from Arctic Cat. 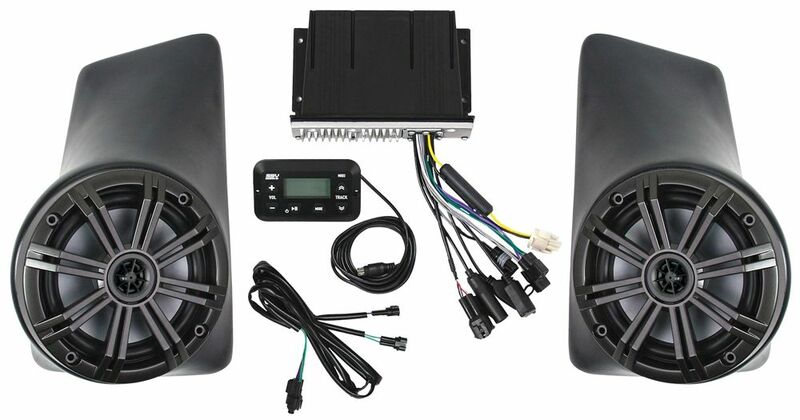 *The package includes a SSV Works AM/FM, Bluetooth Audio Controller; two 6.5-inch KICKER coaxial speakers; custom-fit kick panel speaker pods; a complete wiring harness; and antenna. *All components are marine-grade for premium performance in extreme conditions. *The Bluetooth controller comes complete with a four-channel, 200-watt internal amplifier that is capable of supporting up to eight speakers, plus rubberized buttons and a hyper-white LCD display for visibility in diverse environments. *A built-in AM/FM tuner, USB and AUX input are also included. *The speakers feature splash-and-spray-resistant sealed motors, cones, and locking terminal covers for premium protection from the elements, and are built to last with UV treatments and Santoprene® surrounds that perform in high heat and extreme moisture. *Custom 100 percent fiberglass speaker pods sit high in the kick panels to maximize foot room and are finished in a black texture coat to match the interior. *The Custom-fit Wiring Harness offers easy installation on all Wildcat 1000 and Wildcat X models. *The MSRP is $649.95 U.S./$919.95 Canada. The Part Number is 2436-425. Get 'em at your local Arctic Cat dealer or HERE at the Arctic Cat online store.